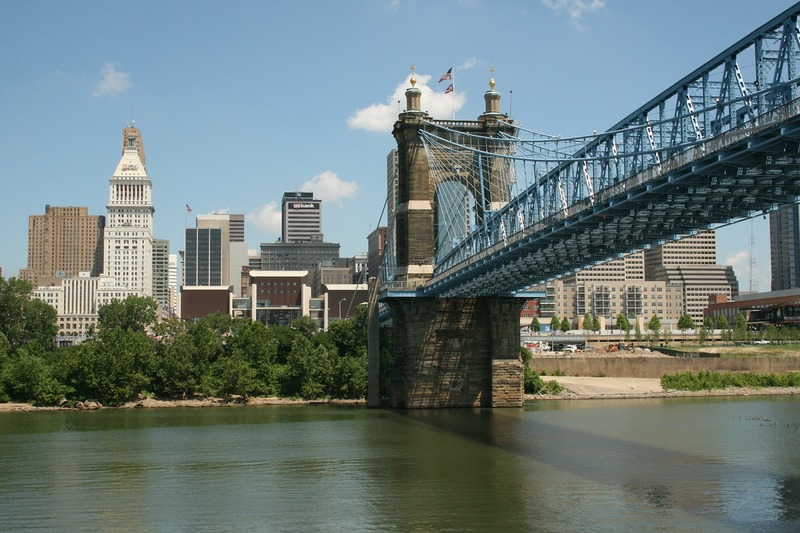 This week I’m visiting my hometown of Cincinnati, Ohio. I only lived here for the first six years of my life, but a child’s first five or six years is a foundation for what’s to come. It’s a place of literal firsts, like first steps, first car ride, first pet, first friends, first happiness, first scrape, first heartache. And those firsts may not be consciously remembered, but they inform who we are. This city has always been a touchstone for me, with plenty of family here to reinforce my memories. When I’m here, no matter what I’m doing or seeing, I feel a sense of permanence and history. I’ve lived other places for much longer periods of time, but Cincinnati is special. As writers, we can’t escape having our earliest experiences inform our work. I set two of my published short stories and my second novel, Calling Mr. Lonely Hearts, here. As I wrote, I mentally traveled over the city’s many hills, recalling its striking architecture, its many bakeries, old neighborhoods with beautiful parish churches, and a baseball stadium or two. And then there’s the river. Always the river. Calling Mr. Lonely Hearts and the stories set in the city are dark, suspenseful works. The characters are (mostly) human enough. But a lot of each story is wrapped up in my worries and experiences of being very shy, and being Catholic, immersed in a culture built on Original Sin and ancient mysteries. The child I was was very present as I wrote. And while the sum of our experiences is in every word we write, those early experiences have been with us the longest. TKZers, please us about your hometown and how/if it affects your writing. This entry was posted in Writing by Laura Benedict. Bookmark the permalink. Suzanne: describes my Philly neighborhood in the 1950s as well. In the summer I would leave the house in the morning, knock on some doors, spend the entire day with my kid buddies on the streets and playgrounds and ballfields, arrive home in time for that “yell” from our mothers that let us know dinner was on the table. Chris, that sense of being free to explore, play, and dream was amazing, wasn’t it? I miss that feeling. Dana: You western PA guys… bet you drank “pop” back then, too. My first brush with “burghers” was at Penn State, where east(ern PA Philly “soda” guys) met west(ern PA PGH). Until then I had led such a sheltered Phluffian (Philadelphian) existence. Made some wonderful western PA friendships while at PSU: Turtle Creek, Butler, etc. I’ll order you a “pop” this year at the C3 Con bar as long as you order me a “soda.” Then we’ll let Gilstrap order a pitcher of beer for all of us. This says it all, Dana. Thank you, Chris. I’ve always thought of Philly as a city rich in culture and texture (if that’s a thing). It’s certainly deep in your bones. Love how you encapsulated it all in your opening. I was born in Los Angeles; lived there for 26 years. Downsized from there to Miami, then Orlando for another 32 years, and now live in a tiny rural town in the Colorado Rockies. I’ve set scenes/books in all of these places, but I think my real “home” is where I am now, as the Colorado settings have influenced my writing more than any of the others. I’ve gone back to LA to visit family, but cars and concrete do nothing but make me want to get back on my mountain. Mountains are so addicting. I really miss living in western Virginia and West Virginia. A tiny rural town in the Colorado Rockies sounds like heaven. There’s something very comforting about being close to mountains— like they’re big, protective guardians. Good for you. I don’t consider any place my hometown, which I suppose does influence my writing because my characters don’t have much of a sense of belonging either. I moved from New Brunswick to Connecticut when I was six months old, from Stamford to Danbury at two, from one house to another until I was nine and moved to Newtown for three years. Three years in Ottawa, and then back to Newtown. I’ve been here the longest, eight years, which is a lot for me but nothing for you other guys, and I thought it was my hometown, until events happened and I realized I didn’t know anybody or anyplace in this town as well as I thought. Screw that, I knew perfectly well I knew barely anybody, but soon I realized how much that shut me out of things, especially since I no longer went to school in this town but was in college. My characters always have this sense of not belonging, and since I haven’t found a hometown yet, it’s really hard to resolve that feeling at the end of the story. I have a WIP, which I’ve put aside for now, where the main character runs from her home. I’ve put it aside because I don’t know how to start mending that break, or when I should start doing it. I guess that’s a project that’ll have to wait. What a difficult way to come by an important theme in your work. I know you’re not asking for advice, but here it is: run toward that WIP. Let your character take that journey of separation and see what comes. Something that powerfully felt makes for excellent depth of story. You may actually find that it’s where her story actually begins. She may never find a fairytale ending with bridges mended, but there are other satisfying endings— both in fiction and real life. Thanks, Laura. I think I’ve also strapped down in other ways, using tropes that’s familiar to me instead of exploring. I’ll have to give it more daydreaming time. I was born in Paterson (NJ) General Hospital (no longer there) and lived, first, in Prospect Park and then, for most of my growing up, in North Haledon. I didn’t recognize any scenes from the movie _Paterson_, other than the shots of the Passaic Falls, but even after all these years and all the changes in the Paterson demographic, a certain ambience remains. North Haledon has not changed much over the years, except perhaps to have gotten more expensive. Thanks, Eric. Having places we know well appear as unnamed in our work doesn’t reduce their power. Ambiance is everything. I can empathize with the more expensive thing–the tiny 3 up, 3 down, 1.5 bath house we were living in during the late sixties became fully priced, around 250K+, back in the mid-nineties. Apologies for the delay in posting. We’ll take a look at the issue. I, too, was born on the Missouri side of Kansas City but grew up in a suburb on the Kansas Side. I now live on the Missouri side. My school years were spent in the Argentine and Turner neighborhoods. We roamed free, walked to school, and used the streets for ball fields. Now the neighborhoods and houses look so small. Kansas City, Kansas was a thriving downtown, with great department stores, four movie theaters and restaurants on the main street. Now it is almost a ghost town. Government buildings and a few pawn shops are all that’s left. And the neighborhoods around downtown have deteriorated into heavy crime zones. So sad. I’ve not used the city in any of my writings, but have long thought of setting a novel here. I’m a graduate of the Shawnee Mission district. Lived in Merriam, then Mission. So neat to connect with someone from the area. Sad to hear about how things have changed so much. Quick question — do you pronounce Missouri as Missouri or Missoura? Missouri for me, Missoura for most of my Cincinnati grandparents. Do you grandparents say Ohio or Ohia? Missouri. My parents and grandparents called it Missoura. Don’t know how I escaped that. I lived in the Highland Crest area during high school. Just on the northern edge of Merriam. We used to go down there to the Mugs Up root beer stand on Merriam Lane. Now that’s all industrial zones. I know the Shawnee Mission area well. There used to be some great shopping areas around there. I too was born in KCMO. Lived in there until I was 8 and then my mom moved us out to the suburbs (Missouri side) where I dreamed of the beach until I was 19. Now I live in Florida. I went back a few years ago. Everything has changed so much. All the places I played when I was a kid are gone. Sad. I haven’t been back to KC since the 80s. I’m sure it would almost be unrecognizable to me. My town here in the Metro reminds me of the KC area where I lived. People smile and nod (not everybody, of course), and many in the service industry still say “Have a good ‘un.” That still tickles me. Thanks, Christine. It’s so nice when a writer creates genuine warmth between their characters. Smiles never go amiss. The South has an embarrassment of story-worthy riches, doesn’t it, Laurie? In Virginia and West Virginia, few people respond with actual directions when you ask for them. I always get, “You know where the such-and-such used to be? It’s past there, and you turn where so-and-so used to live.” There are stories in the smallest things. How lucky you are to have found the feelings of home in so many places. I only lived in Cincinnati six years, but many experiences stick with me. When I first moved there, the Griffey family did, too, and I met them at our apartment complex pool. I lived through The Who concert, and included that in one of my novels. Part of my first novel was set in Mt. Adams. Another part reveals the strong Catholic influence of the city as well as the Reform Jewish movement. I am of neither religion, so they both intrigued me. I was just there last summer to visit old neighbors, who are now life-long friends. Laura, thanks for the link. I was interviewed on the local NBC affiliate. I was in my first teaching job—Colerain High School— and furious that my students missed so many days of school waiting in line to buy tickets then waiting in line for festival seating, then staying home the next day after waiting in line the whole previous day. I don’t think the general public realized the cost of festival seating—3 days of school. I was born in Blackfoot, Idaho and we moved to an small town in Nevada, called Pioche. That is a very interesting town. In the Old West, it was a boomtown. It was a mining camp and flush with silver. In the 1870s it had a population of over 10,000. It was wilder than Dodge City and Tombstone. There were 76 deaths before anyone died of natural causes. It is now what is called a living ghost town. There are 1,002 people living there currently. I thought this would be a perfect place for my first novel. I am writing a historical mystery set in 1871. I left there when my parents died when I wad 12 years old. The last time I visited was in the 80s. I do have friends still living there but the family is gone. I hope I can do it justice. What a cool setting, just waiting for you. How tragic that you lost your parents so young. I’m sorry. OK, guys. I posted three or four hours ago and it still says “Awaiting moderation.” Never had this before. Is this some kind of computer glitch? That’s strange, Eric. To tell the truth, I had no idea that posts were even moderated here. Were there a lot of links or other filter-triggers? Maybe the two links? Maybe, in the end, a good setting to have to combat spam. I’ll address that right away, Eric. I’ve been away until now. WordPress can get glitchy. My family moved to Northern Virginia when I was 7 years old, and excepting those four years in college, I never left the area. I’ve spent significant time in all 50 states and in more than a few countries, but always as a visitor. My wife was BORN in Northern Virginia. Today, we live within 8 miles of my childhood home, and 15 miles from hers. The cool thing about growing up in the DC Metropolitan Area is that I’ve always been in the presence of politicians and spies and military folks. That cynical DC feel that is so prevalent in corridors-of-power thrillers is part of my DNA. As a kid, my friends and I were all free-rangers. We ate at the house where we happened to be, and every friend’s parent had equal disciplinary rights to our own–but with the added burden of getting hit twice, once by Mrs. Howe because I deserved it (truly, I always did; could never walk away from the laugh line), and then again by Mom when I got home. To this day, I am awed by the Mom Phone Network from my youth. How could word possibly spread that fast? John, Living in Vienna, VA and being in the Foreign Service is how I got into thrillers. Have you read the new release, NEED TO KNOW by Karen Cleveland, another DC suburbanite? The metropolitan area is so rich with story ideas. My dream is to speak at Politics and Prose. DC cynical? Say it isn’t so, John. Great writer fodder to grow up with. Free range days. Ahhhhh. Funny that so many of us grew up over-protecting our kids. My theory is that all that freedom gave us wicked imaginations. I was born and reared in Phoenix, AZ, on the campus of the Phoenix Indian School, a federal boarding school for Indian children and teenagers, where my Dad was the librarian, and coached different sports, and my Mom was a nurse at the Indian hospital on campus. When I was a boy, Phoenix had not yet started it’s massive growth surge. We lived a mile from our grocery store. To go to the store, unless we went to one of the several nearby little Chinese family-owned stores, we went north from the campus and over an irrigation canal. There was a sign at the south end of the canal that said, “YOU ARE NOW LEAVING PHOENIX. PLEASE COME BACK SOON” in the middle, and smaller lettering on the lower left side that said, “Pop. 100,000” On the lower right side, also in smaller letters was, “Founded 1881.” The population was 100,000 in 1950. By 1960, the Phoenix population was 439,000, and that canal is now some 40 miles south of the Phoenix northern boundary. The current population is about 1,700,000 with about 4.5 million in the surrounding area called The Valley of the Sun. I wrote all of the dry numbers to show you that I’ve lived in both small city and metropolis environments, all in the same city. My perspectives have grown since I was a boy. I am able to write from those perspectives. For example, I grew up in a hometown with a class AA than Triple AAA baseball team. Now a major league baseball team, The Arizona Diamondbacks. But we’ve had for decades major league baseball here in the form of Spring Training. Some of the biggest stars in baseball have played, coached, or managed in Phoenix, including DiMaggio, Mantle, Berra, Mize, Porterfield, Allie Reynolds (we’re of the same tribe), McCovey, Willie-the-Say-Hey-Kid-Mays, Koufax, Drysdale, Duroucher, Rizzuto, Martin, Jackson, Matt Williams. Baseball great and Hall-of-Famer J.H. “Dizzy” Dean, as well as the notable Joe Garagiola lived here, as has Hall of Famer Randy Johnson. (Shhh about Randy; Phoenix loves Randy Johnson.) Now, we have the 2001 baseball World Champions Arizona Diamondbacks and World Series hero Luis Gonzalez, and basketball great Charles Barkley still with us here. So many, including Dan “Majorly” Marjele who coaches our Grand Canyon University team, and, of course, former Dallas Cowboys great Danny White are still around our hometown. In short, I’ve had the pleasure of growing up in a city where you could leave your doors unlocked and where people used to sleep on their lawns at night, to now where we have our major city problems. We’ve sweated out the final game of a 3-3 World Series during which Luis Gonzalez hit the best-closer-ever-Mariano Rivera’s usually-devastating inside cutter fast ball just over and beyond the infield, to win. It was a wonderful Series victory in a horribly grief-stricken time in Phoenix and in the Nation. We don’t even have overhead aerial pictures of the huge hundreds-of-thousands crown that gathered in downtown Phoenix for the victory parade. You remember why. Air traffic was essentially shut down as America still searched for the reasons and all the persons involved in the bringing down of the World Trade Center. Phoenix, as did every other American city and town and farm, sent our blood, our firefighters, our police officers, and civilian volunteers to New York City to help in the early fights against terrorism. I guess–and I don’t apologize for it–that’s one of the reasons why many or most Phoenicians are determined to shut down corridors that can be used by enemies of America to bring terror and destruction into our country. They aren’t rumors that this could happen: we’ve seen the pictures of prayer rugs and Misbaha, Muslim prayer beads, left on the southern desert areas of our state. We don’t know who they were or where they want. We know that watchers, who have been photographed, interviewed, and shown on our local TV stations, are stationed by Mexican drug cartels within our borders, on hilltops within 50 miles of the our city. We have not learned exactly what purposes their presences there are. But we know the U.S. government has cordoned off area in the State of Arizona where American citizens are forbidden to go because of so-far unrevealed dangers. I guess that means there really IS evidence of undocumented people in America. So, that’s my hometown: a place of wonderful memories, amazing growth and development, excitement, concern, and love as well as great barbeque and Mexican food. Where I’ve walked the streets of our city with no sense of danger in the past, and now when there is some concern about danger. In these days, when much of Arizona State University is being located in our downtown areas and there are probably as many university students are there are business people and government employees all fighting for a place to eat lunch, but where you call find wonderful food truck fare–stop at Berto’s for the best tacos in the American Southwest–I still love it here. I’ve lived away from Phoenix twice–three times if you count the time during WWII when my parents relocated to take the place of a civilian Indian Service employee who would be going into the service. Each time I remember leaving, I’ve been more than sad and depressed. Each time I’ve returned, I’ve been more than glad and joyful. I’ve left incredibly hot, monsoon-strewn Phoenix to live other places where there is often snow and sidewalk-shoveling. Know what? I’ve never had to shovel sunshine off a sidewalk. So I’ll never live anywhere else again. I really can’t live in Oklahoma anymore. I’m a legally-declared incompetent person there. Because my grandparents’ old homestead in east-central Oklahoma, in the Deep Fork Bottom, was granted under the Dawes Act of 1887 allotment in which the federal government granted itself permission to give away our Indian lands without the consent of the tribes–talk about eminent domain–my cousin and I, both university graduates and he a university professor, had to go to county court in Oklahoma and swear that we were too incompetent to decide to sell our family’s property so would-you-do-it-for-us-please. So I’ll stay here in good ole Phoenix. And in the swimming pool as much as I can. Jim, I’m moving to North Scottsdale in the fall. How do I go about finding a writing group? Any suggestions on how to get started? I will contact a couple of friends. I don’t belong to any myself. I will reply here. Glad you finally came to your senses. LOL. Thanks, Jim. Will keep checking here. Wonderful stories! Thank you so much, Jim! Jamestown, New York (famous for Lucille Ball, infamous for Roger Goodell). I made the finals in the Missouri Liars Competition with a story set nearby and based very loosely on my grandfather’s experience as the mechanic for a cross-border whiskey runner during prohibition. The whiskey runner ended up running the Pittsburgh mob. My grandfather lived a long and respectable life. My wife and I have lived in St Charles, Missouri for 25 years (longer than either of us lived in western NY) and it has become home to some extent, but Chautauqua County is home and always will be. We’ve lived other places as well (South Carolina and New Brunswick, Canada), and the influences of these experiences shows in my writing, I think, but there is no question in my mind that the strong roots of WNY ground my work. I am so late! Please excuse my tardiness. It’s been one of those crazy weeks that won’t truly end till Saturday night, after my signing. I grew up in Marblehead, MA, with the obscenely wealthy. You know the type, with Yacht clubs, tennis courts, swimming pools, even though they lived on the ocean, and servant quarters. Old money. We, on the other hand, inherited our house from my grandparents. My grandfather built it with his own two hands (he was Native American, with talent galore) before the upper crust knew the town existed. In fact, my mom grew up in the same house. She acclimated better than I did. Once I hit my early teens I couldn’t stand the “preppies” with their Izod shirts and stiff collars. So, I rebelled, dressing in all black, often in leather, black lipstick, eyeliner, and matching nail polish, which really sent the upper crust on a tangent. Yet, no one said anything about the skin heads. If your family had “old money,” your kids could do no wrong. Long story short, I met a few kids from Revere, MA (not far from Boston) and I’d take the bus there every day after school. No one was judged by their bank account or when they made their money (which I still find appalling). Our little corner of Revere, called The Point of Pines, will always remain near and dear to my heart. My early experiences influenced my character, Shawnee Daniels, who moonlights as a cat burglar in a Robin Hood type way. The series is also set in Revere, but rather than use the Revere of today, I pay homage to the place that welcomed my uniqueness as a teen and young adult. I set my Grafton County Series in New Hampshire, where I live in now, surrounded by nature, wildlife, mountains, lakes, and pine-scented air.